Attention Deficit Disorder (ADD) and Attention Deficit/Hyperactivity Disorder (ADHD) are medical conditions that make learning to read truly difficult for both the affected children and those who care about them. To understand what it’s like to have ADD or ADHD imagine being stimulated by everything you see, hear, smell, taste, etc. Rather than being able to selectively ignore a noise or a strong odour, you become distracted by such common occurrences. Consequently, it’s tough to maintain any sense of focus on even the smallest tasks like tying your shoes or peeling a banana, let alone learning the alphabet and sounding out or recognising words. Though many youngsters with ADD and ADHD are given medications to help calm the symptoms of their disorder and lessen the impact that everyday stimuli have on their senses, prescriptions cannot entirely erase the effects of the condition. This means that teachers and parents must implement very specific strategies when working with ADD and ADHD kids. Some of the best practices concerning teaching the ADD or ADHD student to read are listed below. Be certain to employ creativity when dealing with your son, daughter, or student who has ADD or ADHD. The more you can uncover what “works” for him or her, the easier the process of learning to read will be on everyone involved. The dog is barking. A lawn mower is running outside. The telephone is ringing. The teapot is whistling. While many children naturally tune out such distractions, the boy or girl with ADD or ADHD will not be able to do so. Instead, he or she will become almost obsessively fixated on the new sounds, much to the frustration of the teacher. In order to get the best results from your ADD or ADHD pupil, it’s essential that the learning environment be as calm as possible. For instance, the hour before bedtime might be a good opportunity to work with a child one-on-one in a very quiet surrounding when he or she is less “rowdy”. That way, he or she will be more inclined to focus on the task at hand. The ADD or ADHD child isn’t happy to sit for more than a few minutes at a time, so reading lessons need to be short and to the point. If they become too involved or require large amounts of time, the young person will lose interest and effectively tune out the teacher or parent. Even if you spend just five minutes working on reading, then allow your child to spend another fifteen minutes playing before returning to the lesson, progress can still be made. Many ADD and ADHD kids are quite intelligent; thus, they can absorb and retain information, even if it is presented to them in a piecemeal fashion. Though the computer cannot teach your child to read, it can be a huge asset in the process of becoming literate. Many ADD and ADHD children are fascinated by technology and will actually sit in front of a computer for longer than they will sit in front of a human. You can use this to your advantage. 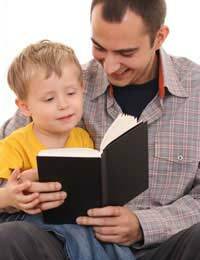 Obviously, it’s not feasible for them to sit at the computer too often, but if your ADD or ADHD son or daughter finds computer games interesting, there are many “learning to read” CDs and DVDs on the market. Just make sure that you look over them before he or she does to ensure they are exactly what you want and need. Having a “label” such as ADD or ADHD does little for a child’s self-esteem. Therefore, it’s important for any instructor, mum, or dad to consistently encourage the ADD or ADHD student who is learning to read. Even simple milestones such as remembering the sound that “b” makes can be celebrated in small ways. Perhaps an extra squeeze is all your pupil needs to feel like a star. Or maybe you want to give extra “stay up past bedtime” minutes to the student who is really trying hard to be a top-notch reader. Regardless of how you choose to say, “Good job,” make sure that you remaining upbeat and optimistic. The process of teaching an ADD or ADHD boy or girl to read isn’t necessarily going to be simple, but the rewards at the end of the journey are enormous.